Advertiser.ie - Do you need extra storage space this summer? If your home or businss needs extra storage TITAN Containers, Oranmore, Co Galway are there to protect your belongings be it furniture, appliances, cold storage units, you name it, they have got the extra space you need. TITAN will even deliver your container/containers to your property or place of business, or if needed deliver and return for safe storage to their base in Oranmore. Portable cold storage units are also available for your business. The secure site in Oranmore has 24 hour access to the storage units, including the coldstores which come in 10ft, 20ft, and 40ft specifications. While the core business remains standard ISO container rental and sales, TITAN has expanded its business activities to include worldwide deliveries of DNV containers to the offshore industry, extremely user friendly power efficient and affordable temperature controlled storage solutions, and locally cost effective self-storage solutions, and finally, transport and crane services. Started in 1987, it is one of the largest privately owned companies supplying containers for a multitude of applications. Its initial target was to pass on the advantages of high volume, providing users with top quality services and competitive pricing. Today it maintains the same targets, operates five brands, and offers worldwide services with a network that is second to none. This year sees TITAN containers celebrating 30 years in business and continuing on from their growth last year opening a new Limerick depot in June 2016, summer 2017 will see both Cork and Dublin depots opening later this summer. 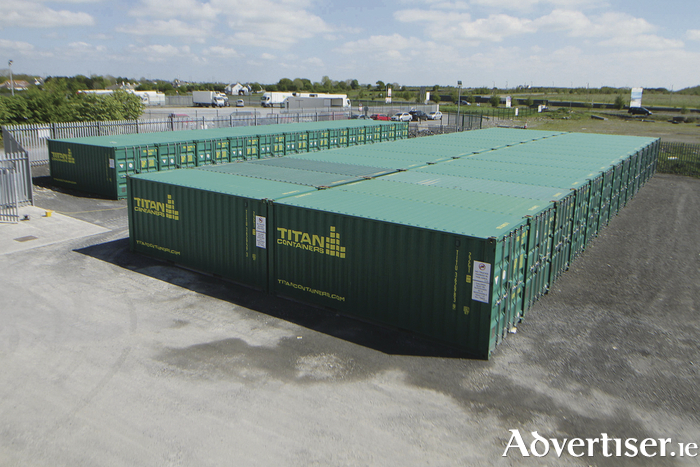 TITAN has 50 new self storage units on site and offers container sales and rental from its location not far off the main Dublin-Galway motorway. Its ever increasing number of regional offices coordinate its worldwide container activities with more than 200 depot locations worldwide. TITAN ensures that containers are as close as possible to there where they are required. TITAN has a well-established network of partners with the local knowledge and expertise required to ensure a high level of service and to meet customers' needs. Call freephone 1800 855707, or visit TITAN Containers, Glenasaul Business Park, Oranmore Co Galway (Exit 19 off M6 beside Cold Move ).